Running a home media server is pretty awesome: beautiful cover art, playlists, and all your media right at your finger tips. One thing media centers fall short on, however, is recreating that feeling of aimlessly channel surfing just to scratch that TV watching itch. 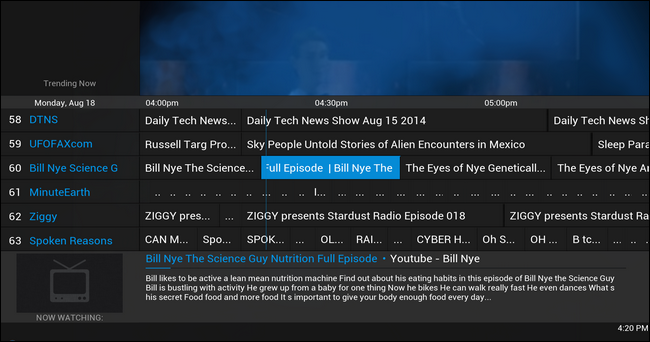 Read on as we show you how to recreate the channel surfing experience on XBMC with the use of a very clever add-on. More and more people are “cutting the cord” and breaking away from the traditional cable-centered TV watching experience. There’s a host of good reasons to do so: TV shows without commercials, media on demand the way you want it, and saving a chunk of change (the average cable bill in the US is $90). One thing that many people find missing from the post-cable experience, however, is the simplicity of turning on the television and just having something on. Would it be nice if you could take your vast trove of media and some streaming sources and combine them into a pseudo-sort-of TV channel system where instead of poring over your media list and carefully picking something out you could just turn on your television and get the same what’s-on-now experience cable provides but, you know, without the cable bill and annoying commercials? 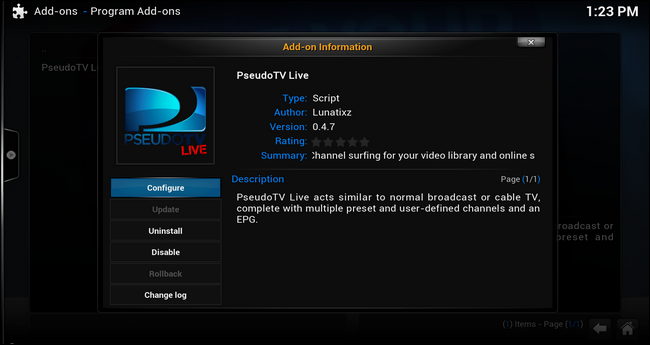 Thanks to the aptly named PseudoLive add-on for the popular XBMC media center platform you can. It’s an extraordinarily clever little plugin that we’re thoroughly impressed with. Let’s take a look at what you need and how to install it. An installation of XBMC 13.0 or higher. We’ve opted to use a branch of the original PseudoTV add-on, PseudoTV Live for two reasons. First, it supports the most recent release of XBMC. Second, it supports live streaming from sources like Hulu, YouTube, etc. 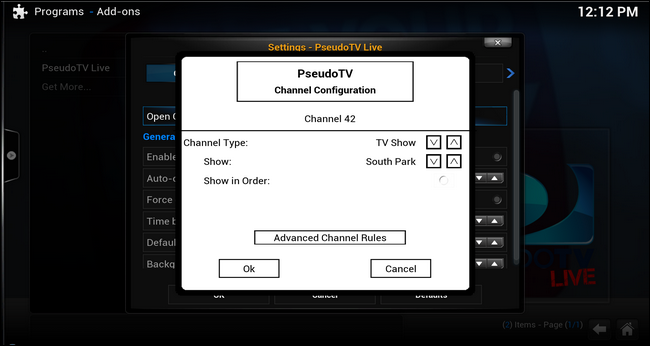 PseudoTV Live’s installation process is the same as any unofficial XBMC add-on. First, download the stable master release .ZIP file here. Once downloaded, fire up XBMC and navigate to System -> Settings -> Add-ons -> Install from zip file and browse to the location of the PseudoTV Live plugin .ZIP you just downloaded. After a successful installation you’ll see a popup like the one above in the lower right hand corner indicating the add-on is installed and enabled. After that you can confirm the status of the add-on by navigating to System -> Settings -> Add-ons -> Enabled Add-ons -> Program Add-ons where you should see an entry for PseudoTV live. If you click on the entry you’ll see the add-on information panel for it. 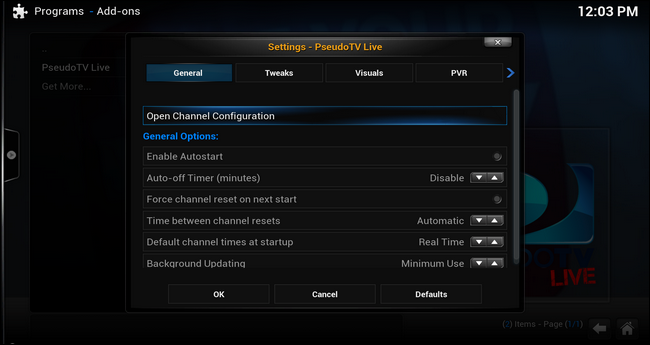 In order for PsuedoTV Live to finish integrating with XBMC and appear in the primary menu, you’ll need to restart XBMC. After restart, navigate to Programs -> PseudoLive TV and run the application. 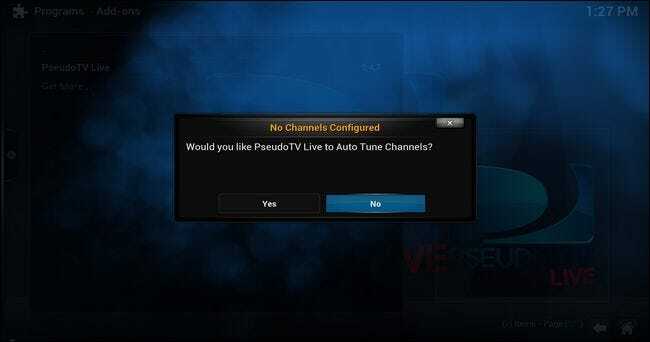 PseudoTV Live will automatically load and tune into the first automatically generated channel (what this channel is and what content it provides is entirely dependent on the media you have linked to your XBMC installation). Here’s an example of what a channel looks like: number in the upper left corner, show summary on the lower portion of the screen. Go ahead and use the up/down arrows on your keyboard or remote (or the PgUp/Dwn keys on your keyboard) to navigate to new channels. Want to check out the Electronic Program Guide (EPG)? Press the enter key while watching a video in PseudoLive TV and you’ll see a screen like the one below. You’ll notice that PseudoLive TV has done it’s best to use your XBMC metadata to create a variety of channels including those named after actual networks such as TV Land, USA network, and TNT (these were created because we have DVR’ed shows from these networks on our media server) as well as general channels such as Action Movies and Animation Movies created based on the media tags from our library. Creating local media channels is a pretty straight forward affair. To create a new channel go into the settings menu for PseudoTV Live by navigating to Programs -> PseudoTV Live-> Add-on Settings. Under the General tab, click on the “Open Channel Configuration” button. 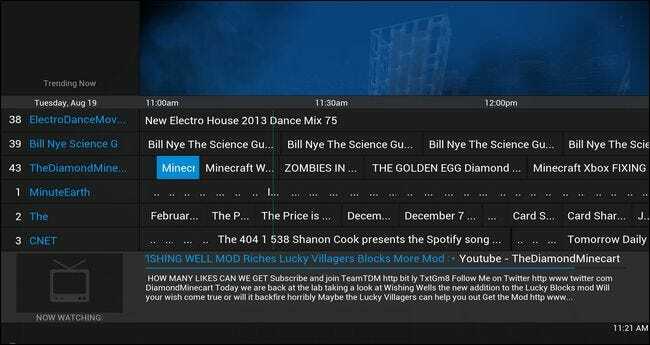 Here you’ll find a list of all the current channels on your system. Find an empty spot to create a new channel and select the empty entry. You can set up a new channel to be a Directory, TV Show, Mixed Genre, Movie Genre, TV Genre, Movie Studio, TV Network, or a custom playlist. Directory will simply play all the media from the selected directory, TV will create a channel dedicated to a single television show (such as an all South Park channel), Mixed Genre will create a channel focused on a single genre such as “Thriller” or “Sci-Fi” and will mix movies and television shows in that genre together (whereas Movie Genre and TV Genre will keep them separate), Movie Studio creates a channel that plays only movies from a certain studio (like Universal Pictures) and TV Network does the same with TV Networks (such as AE or Discovery). The final option, custom playlist, simply turns a playlist you’ve created on XBMC into a channel. For the sake of demonstration, let’s create a 24/7 South Park channel. To do so, we select the channel type “TV Show,” select “South Park” and decide if we want the episodes to be showed sequentially. 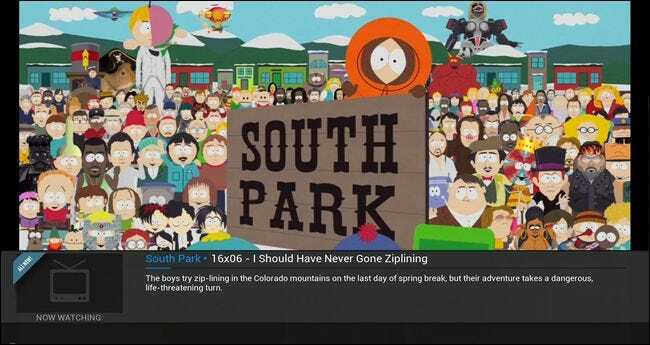 For some shows this is critical (as the show creates an extended story arc over time) but South Park has been on the air for over a decade and has had less than 10 multi-part episode arcs so we feel comfortable letting the show play on a more or less random schedule. Let’s check out the new channel and see what it serves up. All South Park, all the time. Using the simple channel creation system you can create channels for all manner of things. If you already had supported video add-ons installed, such as those for YouTube, Vimeo, Vevo, or Twitch.tv you’ll notice that not only are there channels based on your local media but on popular channels and playlists on the streaming media sites you have add-ons installed for. Notice in the screenshot below the two popular YouTube science channels: Bill Nye the Science Guy and Minute Earth are both pre-loaded. What if you want to add in your own YouTube channels though? There’s two ways you can go about it, one semi-automatic way (that’s YouTube specific) and one manual way that can be adjusted to work for just about any streaming video source. The semi-automatic way involves logging into your YouTube account via the add-on and letting it turn your subscribed channels and playlists into channels for PseudoTV. If you have a YouTube account (and you keep an active list of subscriptions) you can go to Programs -> PseudoTV Live-> Add-on Settings and then navigate to the “AutoTune” tab and scroll down to the “Plugins” menu. Here you’ll find settings for your video add-ons, including YouTube, and you can enter your YouTube username and password to import your subscribed channels and favorited videos. That’s easy enough, but things get a little trickier if you want to do more advanced importing. For advanced importing you’ll need to manually edit one of PsuedoTV Live’s configuration files. Let’s look at how you add in a YouTube channel via manual configuration. First, you’ll need to locale the settings2.xml file. This file it located wherever your operating system stored the application data for XBMC. In the case of Windows, for example, it’s default location is \%AppData%\Roaming\XBMC\userdata\addon_data\script.pseudotv.live\settings2.xml. Note: some PseudoTV Live users report that this file is not created until they turn on the “Channel Sharing” feature located in the add-on settings menu under Sharing -> Enabled Channel Surfing. Even if you’re using a single unit and don’t need the sharing function you may need to toggle it on to force the creation of the channel list. Once you’ve located the settings2.xml you’ll need to open it up in a text editor to edit it. We strongly recommend using a text editor with proper code parsing and display. If you open it up in Notepad or another ultra-basic text editor the formatting is very messy and very difficult to deal with. If you open it up in a more advanced text editor like Notepad++, however, the code will be neatly formatted and easy to work with. The help file for PseudoTV Live details how to add different channels from different sources, but we’re going to focus on adding a simple YouTube channel here. To add a YouTube channel you need to identify three things before we proceed. First, what number the channel will be, what the username of the YouTube channel you’re subscribing to is, how many back-videos you want the channel to access, and what you want PsuedoTV Live to display the channel description as. You need to replace all of the bolded elements in the template above with data specific to the new channel. We’re going to replace the “Channel_#_” bit in each line with “Channel_43_”, then fill in “TheDiamondMinecart” for the YouTube username, the number of back videos as 50 (it can be any value but higher values require more processing power/time as the add-on has to parse out metadata for the backlog), and a channel description. The channel description is what will be displayed in the on-screen guide (so use something descriptive and around 14 characters in order to see the full name at once. Here’s what the edited code looks like. Now, all you need to do is simply insert the edited block of text into your settings2.xml file. We’re inserting it at the very end (because we made a new channel at the end of the list) but if you’re replacing another channel insert it at the appropriate place in the list. Note that the new channel is within the <setting></setting> tag. As long as you fill in all the values, you don’t select a channel number that conflicts with another channel, and you keep it inside the settings tag, everything should work just fine. Let’s fire up PseudoTV Live and see how our new channel looks. Fire it up, and you’ll see your favorite YouTube channel on your television set, configured like a TV channel. By following along with the PseudoTV Live formatting guides you can add more channels, playlists, and video sources from a variety of supporting streaming sites. Now that you have the basics of setting up a local and streaming channel down, we’d encourage you to explore the wide range of settings available in the add-on configuration menu. While we’re not going to go through every possible configuration, we are going to highlight some configuration menu options you might want to take a peek at, grouped by the submenu they’re found it. Here you can enable PseudoTV Live to automatically start, to play in real time (like actual TV) or to pause whenever you aren’t actively watching (useful for shows you’re following closely and would like to pause until you return). If you find that PseudoTV Live is lagging your system, you can also adjust the update frequency here to decrease the load on your system. The tweaks section is primarily focused on adjusting how the channels act and appear. You can insert a fake channel delay (just like you experience when using a TV tuner), select what will play on startup (last channel or a prefered channel of your choice), and turn flagging on and off (if you’re using this setup as a kind of background noise instead of actively watching you may wish to turn off the “watched” flag so XBMC doesn’t think you’ve actually watched the content). One of the most useful tweaks in this section is “Reserve Channels 501-999″ for Autotune” as it restricts the automatically created channels to that block. The toggle and adjustments in this submenu change the add-on’s skin, how the on-screen guide looks, and whether or not it will display logos for the different channels. You can also adjust the size and color of the on-screen channel number and various on-screen elements like the “Up Next” display box. This section includes some highly experimental (or presently unavailable) options regarding integrating XBMC and PseudoTV Live with PVR software/hardware backends. Unless you’re willing to play beta tester for these features, we’d recommend skipping over this section entirely. If you want to play with it then be prepared to do some serious reading in the PseudoTV Live discussion threads. We recommend playing around in this section early on as the AutoTune function recreates your channel list every time you use it. This is a very powerful submenu that automatically creates genre, network, and studio channels based on your input as well as channels based on popular YouTube channels and the like. Enables crowd-sourced channel content similar to the “channels” found on Pluto.tv. You can opt for a wide range of channel topics including TV, Movies, Episodes (dedicated to a single show), Sports, News, and Kids. Short for Bumpers, Commercials, and Trailers. Allows you to insert these content types into your PseudoTV experience. Bumpers are the television equivalent of splash screens like when the network’s logo spins up on the screen and then vanishes. Commercials are, just like they sound, commercial content. You could, if you wanted, take a bunch of vintage 1960s commercials ripped off YouTube and insert them in your fake TV channels. You can also insert current TV ads using the iSpot.tv servers, as well as YouTube playlists. While most people use media servers specifically so they don’t have to see advertisements, we’ll admit there is a certain novelty in injecting advertisements for odd or dated thing. You could, if you desired, inject a giant playlist of funny foreign advertisements into your channels. 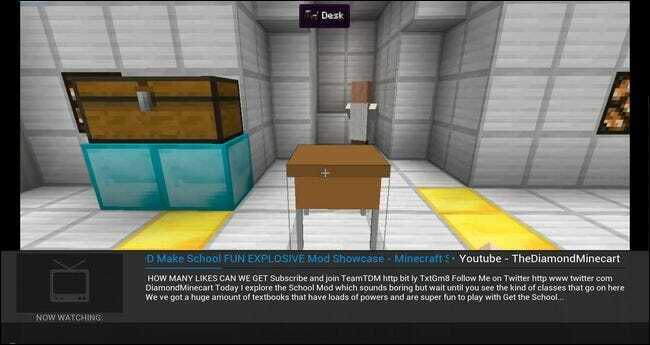 The trailers function allows you to inject movie trailers into your channels. You can specify where they come from (YouTube or local content), how often they play, and on what channels they play (e.g. only on movie channels or on all channels). 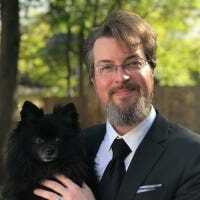 Support for HD-Trailers.net is in the works. This section contains features available only to those that support development of the add-on. If you donate your copy of PseudoTV Live will support access to Bring the Popcorn and Cinema Experience. Bring the Popcorn is a website devoted to scouring YouTube for full movies and then creating useful indexes of them. Cinema Experience adds in a channel that mimics the setup of movie theater movies: intros, outros, trailers, announcements, and other features found in a traditional movie theatre experience. Whether you use AutoTune once to set it up or you pore over your channel choices, PseudoTV Live delivers what it promises: a simulated broadcast TV experience that injects a high level of novelty into the media center experience. It’s not for everyone, but if you’ve been longing for a way to enjoy the sort of impulsive “I wonder what’s on?” channel surfing that a cable box offers, this add-on certainly delivers.